Our test car was priced at $31,490. Our test car was a Mazda6 Grand touring model with a base price of $29,495. Price with options was $31,490. Mazda has done a most excellent job with the redesign, no, the rebirth of the 6. Spilling with power for its class with 184 horsepower and SKYACTIV 6 speed sport, it is an absolute pleasure to drive this responsive and exceptional handling vehicle - a very fun car to drive. SKYACTIV is Mazda's innovative solution to improve fuel efficiency and performance in its line-up. The Mazda6 we drove was powered by a 2.5 liter 184 horsepower, four cylinders, backed by a six speed automatic transmission. The Mazda6 is a front wheel drive car. In spite of what sounds as a fairly small engine, the Mazda6 showed brisk acceleration and plenty of go for even the most challenging of driving tasks. 28 city miles and 38 highway miles. The Mazda6 we drove was powered by a 2.5 liter 184 horsepower, four cylinders, backed by a six speed automatic transmission. The Mazda6 is a front wheel drive car. In spite of what sounds as a fairly small engine, the Mazda6 showed brisk acceleration and plenty of go for even the most challenging of driving tasks. Looking nothing like its 2013 predecessor, this is one of the most well designed vehicles I have seen. Mazda has placed itself ahead of the class with a style and design that has the exterior sophisticated lines of a Mercedes, with a blend and influence taken out of the muscle genre. With an early 2014 introduction, the midsized family sedan has never looked more exceptional and the Mazda6 Grand Touring has set the pace. Outside and in. In and Out. This five (5) seater is very roomy; the trunk cargo is also cavernous at 14.8 cubic feet (slightly less space than others in this class) . Plenty of organization and compartments. All of that said, and again, its 'just' 31 thousand dollars. Let's take a closer look... This is, simply put, a superb, superb automobile. Hands down, it's the best that the intermediate family sector has to offer. Classy looks, a sleek, European looking design, sporty handling, steering that is well-balanced and tuned to perfection, and braking that is dead on accurate all help make the Mazda6 a clear winner. The interior is refreshing in that the materials used are beautifully done, with double red stitching on the seats and elsewhere. The dash looks like it come out of a BMW or other European make. And unlike many competitors, Mazda eschewed the use of fake wood, and the interior looks all the better for it. Only Ford's Fusion comes even close to touching the Mazda6; and by virtue of the Fusion's counterintuitive MYTouch, and some occasional spots where the power steering on the Fusion seemed to have slacked off, the Fusion comes in second to the Mazda6. Toyota's Camry, the Hyundai Sonata, Chevy Malibu and the others in this bracket don't even come close to the Mazda6. This car should own the intermediate market. Driver and Passenger Air Bag, Side Head and Rear head Air Bag, Brake Assist, Smart City Brake Support. ESC, 4 Wheel ABS and Disc Brakes, Traction Control, Tire Pressure Monitoring system, Traction Control, Lower Anchors and Tethers for Children (LATCH). 24 hour Roadside Assistance. Anti-Theft Engine immobilizer. The Blind Spot monitoring System is a real support for you as is the Forward Obstruction Warning (FOW), and Lane Departure Warning System (LDWS). The Insurance Institute for Highway Safety (IIHS) has rated it a "GOOD". Earning a Top Safety Pick+ rating from the Insurance Institute for Highway Safety (IIHS), standard safety features for all 2014 Mazda6 models include six airbags (front, side and full side-curtain), whiplash-reducing front headrests, power-assisted ventilated front and solid rear disc brakes, anti-lock brakes (ABS) with Electronic Brakeforce Distribution (EBD) and Brake Assist, daytime running lights, Dynamic Stability Control (DSC), a Traction Control System (TCS), hill launch assist, a fold-away brake pedal assembly, a trunk entrapment release system, a tire pressure monitoring system (TPMS), three-point safety belts for all seating positions, front seatbelt pretensions with force limiters as well as Lower Anchors and Tethers for Children (LATCH). The Mazda6 has paddle shifters. Paddle shifters? Who uses these and how much do they cost? Women are NOT utilizing this wasted feature and would rather save the money than add this annoying and meaningless attribute. OK, enough said. Additionally, this car C-R-A-N-K-S it with Bose speakers and sound system, USB audio input and HD radio. Sirius Radio and BlueTooth for hands free talking. Rain-sensing wipers, heated side mirrors, moonroof, and very comfortable and plush leather and heated seats are included. Love the customized lumbar system for the driver's best seating. Love the Hill Launch Assist and the Rear Cross Traffic Alert. Pandora Internet radio connectivity, voice-controlled audio controls and hands-free text messaging capability with the 6. The NAV system is functional and appreciated, though I am no Tom-Tom fan, as it is not as user-friendly and the interface is tricky. Mazda has taken some criticism for the 5.8" screen, not being as big as it could be. The Mazda6 was designed using the company's acclaimed Skyactiv, Mazda's fuel-efficient and performance-oriented engineering philosophy acclaimed Skyactiv technology. This is a wholistic approach to designing Mazda cars, not simply concentrating on engine components to deliver higher fuel economy and performance. Mazda says the Mazda 6 has the brand's "ground-breaking all-new suite of SkyActiv technologies - engine, transmission, body and chassis - all working together to deliver outstanding driving performance and fuel efficiency. The SKYACTIV-Body and SKYACTIV-Chassis ensure that the vehicle structure is not only reinforced and quiet but also rigid and able to absorb impact. The SKYACTIV-Body is comprised of 61.0 percent high-tensile steel, creating a lighter, stronger body with superior handling while the SKYACTIV-Chassis weighs less than current Mazda platforms and includes a front strut suspension and a multi-link rear format along with an assortment of design changes"
The price includes 19 inch alloy wheels, rain-sensing wipers, heated side mirrors, dual exhaust with bright outlets, a power moonroof, leather trimmed seats with a heating system for the front seats, an eight way power driver's seat with power lumbar support and seat memory, a tilt and telescoping steering wheel, a color touch screen display and navigation system, paddle shifters, a Bose 11 speaker sound system, USB audio input and HD radio, Sirius Satellite radio and Blue Tooth. Four wheel disc brakes, an electric power assisted steering system, bi-xenon headlights, adaptive front lighting system halogen foglights, a full complement of air bags, steering wheel mounted controls, cruise control, power windows, center console sliding armrest, rear seat armrest with cup holders, antilock brakes, traction control and dynamic stability control and lots of other items are included in that price. With the optional radar cruise control, destination charges and similar fees, the final price is $31,490. Touring models feature a Blind Spot Monitoring (BSM) system and Rear Cross Traffic Alert (RCTA) as standard equipment with the Smart City Brake Support (SCBS) system available as part of an optional package. Grand Touring models feature BSM, RCTA, SCBS and an Adaptive Front-lighting System (AFS) as standard equipment. Forward Obstruction Warning (FOW), Lane Departure Warning System (LDWS) and High Beam Control (HBC) are available as part of an optional package. Again, Mazda has outdone itself - and, perhaps the competition. The design language on the exterior and inside is clean, bold and luxurious. The lines on the car both front and back are good for visibility - great, as blind spots are a pet peeve of mine as Mazda passes 'our' test. 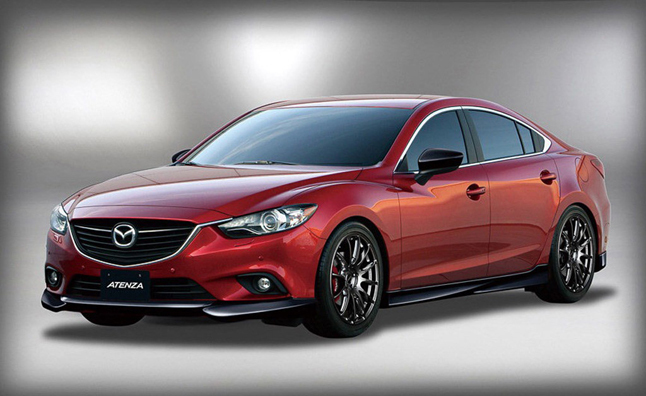 Mazda is showcasing - and, we are loving their "Soul Red" palate. Based on Mazda's stunning Takeri concept and flavored by the company's Kodo "Soul of Motion" design philosophy, the Mazda6 has kept virtually all of the styling elements from the concept and it's almost impossible to see the difference. The four door coupe theme has, of course, been used in many places, but Mazda6 is one of the best around. It looks graceful and sleek, like a much more expensive automobile. The rear end in particular, when seen from the side profile perspective doesn't look as thick and flabby as we have seen on similar "four door" coupe models. Instead it looks graceful and elegant, with the entire side look bringing to mind classic Jaguar sedans of say, the later 1990s and early 2000s. 36 month, 36,000 miles Bumper to Bumper, 60 month, 60,000 mile Powertrain. 24 Hour Roadside Assistance. Basic 3 year / 36,000 miles, Free Maintenance N/A. Drivetrain 5 year / 60,000 miles Roadside 3 year / 36,000 miles, Rust 5 year / Unlimited miles.